With Equity Bank’s recent announcement of the upcoming launch of their MVNO, one can easily surmise that we’re going to see a whole new kind of leapfrogging of legacy infrastructure take place in East Africa’s foremost economy. The initiatives planned by Equity have the potential to trigger the cash based, informal economy’s catapult over traditional means of formalization, straight into a cashless digital economy, that too on the mobile platform. Speculation has been rife ever since Equity won a license for mobile virtual network operations (MVNO) that the bank would compete with telcos for a share of Kenya’s highly competitive and forward looking mobile telephone business. But if one listens carefully to their livestreamed press launch earlier this week, one can see where their emphasis truly lies. This MVNO has been established in order to provide the bank with a wholly new distribution channel in addition to their existing points of service. Forming their own mobile operations allows them to ensure secure, stable and reliable IT infrastructure and data services. In fact, they’ve just announced the establishment of a new $34 million data centre in addition to their existing facilities. The market for cashless payments in Kenya is expected to expand significantly in the coming months. Last year, President Uhuru Kenyatta directed that cash payments be banned from the public sector beginning April 1, 2014. By the end of July, all public transport vehicles are expected to be using electronic payments, according to regulations gazetted by the National Transport Safety Authority earlier this year. 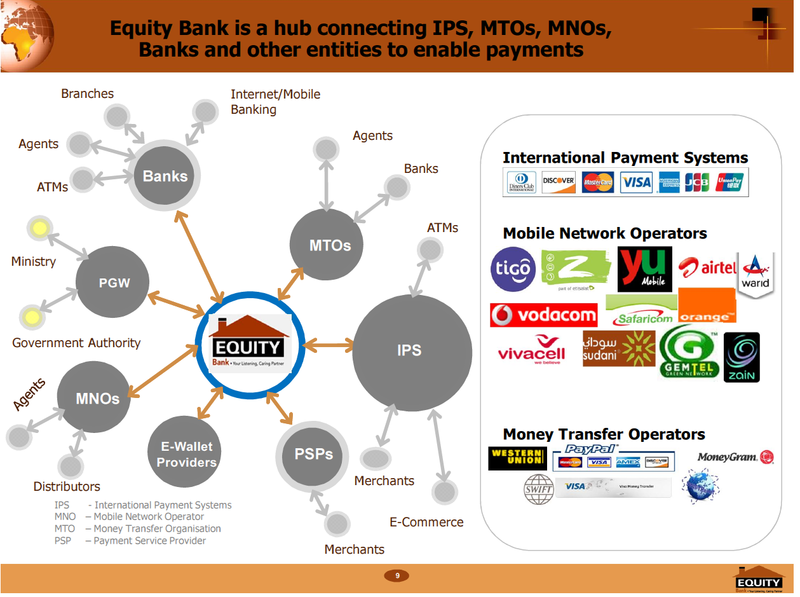 Therefore, if Equity Bank can provide the market with an integrated ecosystem with which to handle all these payments seamlessly, then this could provide a fresh and robust revenue stream. The management knows the benefits of going mobile. “To really bank the unbanked, we need to go cashless because the biggest cost of doing financial transactions is actually cash,” Mr Staley added. Earlier, I’d covered Beba Pay, their joint initiative with Google to provide NFC enabled cashless bus fares and speculated on the challenge faced by introducing technology requiring massive behavioural change by the end users. There had been resistance to adoption by transporters and the scheme wasn’t turning out to be as popular as imagined. Why should this launch be any different, and why am I framing this initiative as a genuine disruption of both the informal economy as well as financial services, both on and off the mobile platform? Essentially what I’d been saying back then was that the cashless transport payment solution had been introduced in isolation from the entire ecosystem of the cash based informal economy. Now when we look at what Equity is proposing to launch in July, we see an entire payment ecosystem. One that seems to offer the flexibility of cash without the friction of being locked into a system. 1. A special SIM to all 8 million of their customers, a good majority of whom are among the lower income segments or part of the rural economy, an act of inclusion on which they’ve made their name. It comes with the mobile wallet and allows secure mobile banking and payments. 2. At the same time, they are distributing 300,000 NFC enabled smartphones to merchants around the country. On Monday 21st April 2014, Equity Bank announced it will distribute 300,000 NFC-enabled smartphones free of charge to supermarkets, restaurants, kiosks and barbershops as it seeks to boost income from the payments processing business. Taken together, you can see the seeding of a critical mass of technology being made available among buyers and sellers for cashless transactions. Frictionless payment processing comes into being when the costs of the middleman’s infrastructure are able to be absorbed by the single window provision that a bank which is also a telco can enable. When the myriads of other details of their strategy are taken into account – opening a new Equity account would be as easy as sending a shortcode message, or the content platform hinted at during the press conference but yet to be revealed, one can conjecture the potential for disruption inherent in this space when everything goes live in July. There’s mention of offering mobile innovators a global payments platform to further spur commercial activity. This won’t just stay within Kenya like Safaricom’s MPesa. Both Equity and their mobile infrastructure partner, Airtel, refer to their operations across the East African region, which when seen in light of the increasing regional integration taking place for trade and cooperation, imply scale in the forthcoming near future that will impact socio-economic development as much as the mobile phone originally did. This just might finally put that bank in your pocket. Yes indeed! Certainly a game changer. I was reading an article: Understanding Platform Based Digital Currencies by Ben Fung and Hanna Halaburda. One of the salient points was how transferrability of digital currencies was crucial for its adoption as a means of payment outside the platform. You hit the nail on the head. Having to pre-plan my transport fare for example was a nuisance. Sometimes I'm out of cash but I have money on my beba pay card. However, it's utterly useless when I need to eat for example. This, slightly deterred me from prepaying significant amounts onto my card. Like you said, imposing behavioral changes is a huge ask. This will certainly be addressed by Equity. If my prepay card can pay anyone, then I have no qualms holding ecash on it of whatever amounts. I need not change. I do however see a risk in Equity Bank dominating the space, just like Safaricom. While it'll certainly help the informal economy, and by extension the poor, will it offer the lowest prices possible? Or the lowest prices possible + Equity Bank's premium? I see the latter. I'm dubious of large Banks dealing with the poor. PS: I'm not dismissing the nifty set up that it is, nor the huge leap in incorporating more people into the fold that this move will achieve.